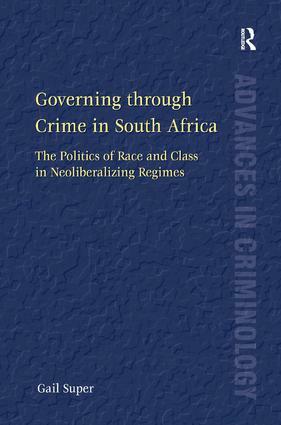 Gail Super is a Post-Doctoral Research Fellow at the Centre for Criminology, University of Cape Town, Cape Town, South Africa. She has a PhD in Law and Society from New York University, where she worked with David Garland, an MSc in Criminology from the London School of Economics, where she worked with the late Stan Cohen, and a law degree from the University of Cape Town. Before embarking on postgraduate studies Gail practiced as a human rights lawyer at the Legal Assistance Centre in Namibia and as an international human rights consultant, with a focus on children in trouble with the law. It was under her stewardship that the Legal Assistance Centre was awarded the UNICEF Maurice Pate award for innovation in the field of children’s rights. She has had articles published in leading international journals such as the British Journal of Criminology and Theoretical Criminology.